The towns on Ocean County’s northern barrier island have always been home to a unique mix of longtime, year-round families and summer vacationers. That very combination led to an unusual scenario is the early days of World War I, as Americans nationwide prepared to go to battle in Europe. Unlike today’s armed forces, the American military of 1917 was drastically smaller than the European powers of the time. The U.S. Army fielded a force of under 100,000 soldiers while the National Guard had about 115,000 troops on hand. Defense authorization laws passed after the United States declared war on Germany in February of that year called for a force of 1 million men, but only 72,000 volunteered, leading President Woodrow Wilson to authorize the first draft since the Civil War. By that spring, solid plans for conscription began to take shape, and the the nation’s mechanism for drafting soldiers placed a heavy responsibility on the Jersey Shore. Today’s American military-aged men must register for the draft at age 18. But during World War I, the process was much different. Instead of filling out a form on one’s birthday, the immediacy of raising a large army necessitated a nationwide “draft day.” As it turned out, that day was June 5. All men between ages 21 and 30 were to report to a post office and fill out a draft card – even if they were “down the shore” on vacation. Businesses closed, churches rang their bells and some towns even held parades. 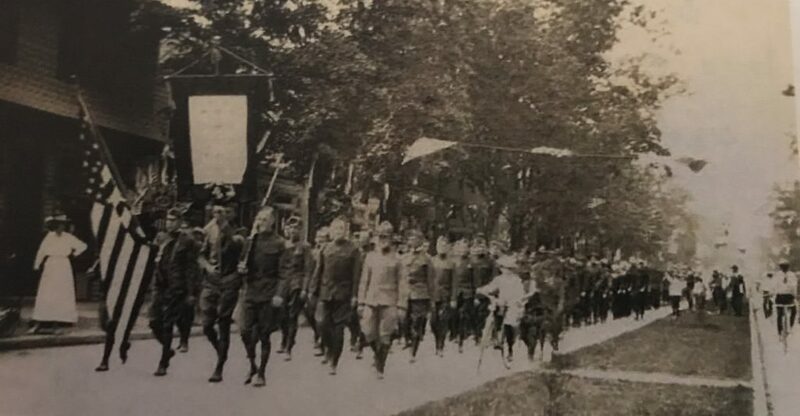 While the influx of summer visitors to towns like Lavallette, Seaside Heights and Seaside Park was not quite as voluminous as today, it was a major effort to organize so many people who were away from their full-time homes, said Timothy G. Hart, Ocean County Historian and coordinator of the county’s World War I centennial program. The draft cards were supposed to be mailed back to the home county of each registrant, but in practice, many of the records were retained locally. That has made it more difficult for the Ocean County Cultural and Heritage Commission to determine how many residents of each town served and how many made the ultimate sacrifice for their country. The same process was repeated June 5, 1918, with a supplemental draft day on Aug. 24, 1918 – again, in the middle of the busy Shore tourism season. By then, the first large influxes of troops, both volunteers and draftees, had been trained and began fighting in Europe. The war ended with an armistice on Nov. 11, 1918, but not after 4 million troops were deployed and about 110,000 died overseas. Every community in Ocean County sent troops to war, and most had at least one resident die in battle. On the island, 65 Seaside Park residents served, the second-most of any town, while 15 Seaside Heights residents and seven Lavallette residents served. Bay Head, with 119 veterans, sent the most men to war. With 13 residents sent overseas, the smallest island town – Mantoloking – had the fewest number of veterans. Countywide, Lakewood, Point Pleasant Beach and Toms River sent the most troops overseas, with 471, 377 and 330 from each town, respectively, serving. On an island where family tradition is still held as one of the most important aspects of its communities, it may not be surprising that relatives of current residents were among those who served. Even among current elected officials, relatives of recently-retired Seaside Heights Councilman Guy Mazzanti served. A relative of Lavallette Councilman Robert Lamb died in the war. The Ocean County Cultural and Heritage Commission has been working for years to catalogue the names and hometowns of the 2,358 World War I veterans in the county. In recent weeks, as the 100th anniversary of the armistice approaches, officials have been traveling to each town in the county to present a flag commemorating the war and those who served. Each flag also includes gold stars to represent each person from a particular town who gave their life for their country. The flags were hand-knitted by members of the Seaport Stitchers Quilt Guild in Tuckerton, who traveled to Cape May two years ago to examine a flag that had been produced during the war so they could recreate one for each of the county’s municipalities. Freeholder Virginia Haines presented Lavallette’s flag to the town at Monday night’s council meeting. The county has been remembering the Great War throughout the year. In May, officials planted a Tulip Poplar tree in front of the historic court house in Toms River, the same species that was planted across the country after the war ended to mark the sacrifices of those who served.